Pictorial map by Pieter Boudewyn van der Aa (fl. 1700-50) of Goa Velha in Daman and Diu dated 1719. 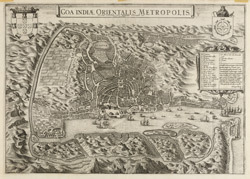 Inscribed: 'Goa Indiae Orientalis Metropolis' and 'A Leide chez Pierre Vander Aa'. In 1510, Goa was taken from the forces of the Adil Shahi dynasty of Bijapur by the Portuguese under the command of Affonso D'Albuquerque. In the 16th century, Goa Velha (Old Goa) was a thriving city known as 'the Rome of the East'. However, thanks to recurrent epidemics and challenges from the English, French and Dutch in the mid 17th century, the Portuguese capital moved to Panaji close by. This map shows the protective harbour, settlement and surrounding hills at Goa Velha. Goa remained Portuguese colony until 1961.